this is a follow-up of my posting from 14.10.2013. Meanwhile, I've got Windows 8.1 Home Premium with XAMPP 1.8.2-2. To work on an existing (proudly handcraftedt) project, I invoked File > New project from existing files, selected "Web server is installed locally, source files are located elsewhere locally". I entered "http://localhost" as web server root, "myproject" as web path and "c:\xampp\htdocs\myproject" as local path. All files are found and everything seems to work fine - up to the moment, when I try to save the project FIle. Does anyone of you have any idea? Also .. instead of New Project Wizard -- just try "Open Directory" (everything else that wizard does can be configured/done manually later). Didn't come to this point, because I found another solution meanwhile. 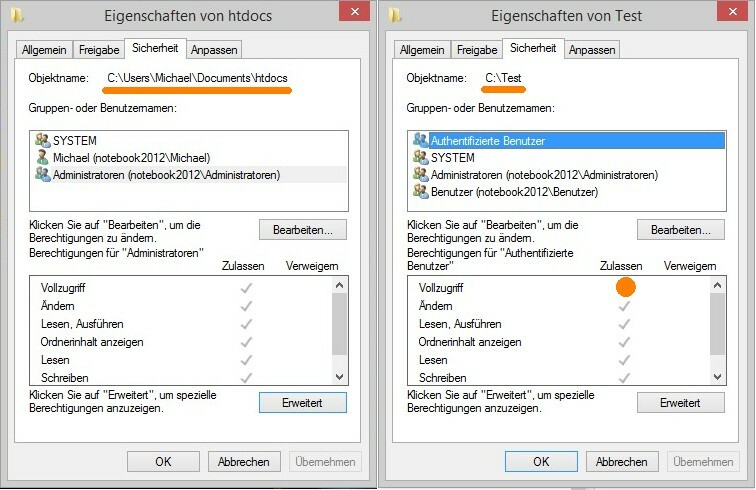 I figured out, that a usergroup named "authenticated users" (in german: "Authentifizierte Benutzer") had access rights in folders outside c:\users\... . I created c:\test, and granted all access rights to "authenticated users", moved my PHPs into that folder. Now, "File > New project from existing files" worked fine in this folder. I figured out, that for my original htdocs-folder c:\users\...\htdocs, the usergroup "authenticated users" didn't have any rights.